On the east side of Osaka Bay is a jumble of prefectural and city highways crossing canals, rivers, streets, ports, and each other. From Konohana Bridge a dozen interesting bridges can be seen. A few hundred meters from the Konohana Bridge is the Tempozan Bridge on the Wangan Expressway. 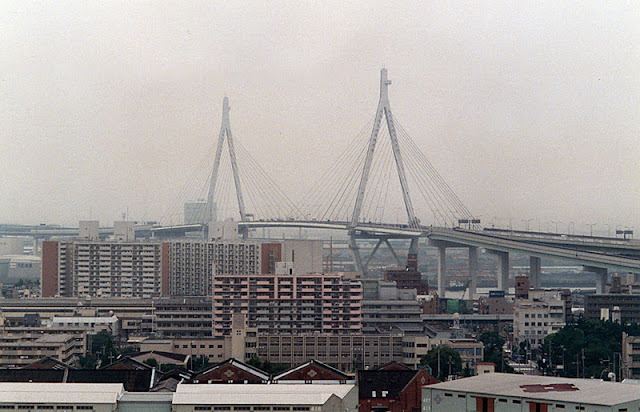 It looks similar to the Konohana Bridge but with two diagonal planes of cable-stays along the sides of the towers instead of a single suspension cable on the top of the towers. It is a three span continuous steel cable-stayed bridge on cast-in-place piles that crosses the Tempozan Canal in Osaka. The main span is 350 m long and the side spans are 170 and 120 meters. It was built in 1988 for the Hanshin Expressway Public Corporation and cost 25 million yen. In 1998, we lived for a month in Kobe on the west side of Osaka Bay. Every day I would watch the smog fill the sky until I could barely see bridges a few hundred meters away. Osaka Bay Bridges: Tempozan Bridge by Mark Yashinsky is licensed under a Creative Commons Attribution-NonCommercial-ShareAlike 3.0 United States License.